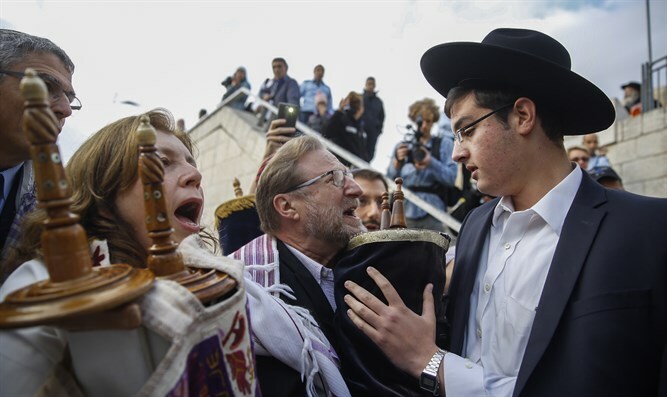 'Women of the Wall' demonstration sparks clashes with worshippers at holy site. A provocation organized by the radical feminist group Women of the Wall in the Old City of Jerusalem set off clashes Wednesday morning when the group attempted to set up a de facto Reform prayer site in the Western Wall plaza, in violation of the status quo at the holy site. A procession organized by the Women of the Wall, made up largely of members of the Reform and Conservative movements, entered the plaza at around 6:30 a.m., marching through as local worshippers who were in the midst of Rosh Chodesh prayers said at the beginning of a new month in the Hebrew calendar. Worshippers at the site protested the disruption created by the procession and decried the attempt to subvert a major element in the delicate status quo arrangements between religion and state that have governed religious life in Israel since the founding of the state. Hundreds of observant Jewish women who pray at the Wall daily expressed their strong resentment of the media-accompanied arrival of the provocative group, who come to the site only on the first day of the Hebrew month and show disrespect for the longtime traditions mandated by the Rabbinate and disrupt their prayers. According to advertisements for the event, the 6:30 procession was slated to culminate in an 8:30 “Equality Prayer Service of the Reform and Conservative movements at the central plaza [of the Western Wall]”. The procession and planned “equality” prayer were organized by Women of the Wall chairwoman Anat Hoffman, a long-time radical feminist activist and member of the Israeli far-left. Hoffman, a member of the radical Women in Black group which opposes the continued Jewish presence in Judea and Samaria, once served on the Jerusalem City Council on behalf of the Meretz faction. During a BBC interview several years ago, she revealed that the Women of the Wall was not about prayers for women, but a first step in having the Reform movement recognized by the state. “The Prime Minister is so close to implementing a historic solution to the conflict over the Western Wall,” said Hoffman, referring to a conflict she is largely responsible for creating. “While he himself supported this solution,” she added, referring to plans to create an alternative prayer site at the Western Wall for Reform services, “he has been deterred from implementing it because of haredi [coalition] threats.” Religious Zionists rabbis, however, are also opposed to the actions of Women of the Wall. The Western Wall Chief Rabbi, Rabbi Shmuel Rabinowitz on Tuesday lamented the planned procession, calling upon its planners to cancel the event.